The health and wellbeing sector has long understood the value of nature for people’s wellbeing. The value of green spaces to people living and working in towns and cities is increasingly recognised by Governments. The current EU Green Infrastructure and Ecosystems Services Strategy links closely with the EU’s Health and Wellbeing Strategy. It is increasingly understood that green space provides a range of ecosystem services: ecological function, visually softening the built environment, supporting biodiversity, aiding to people’s mental and physical health, and providing a communal focus and sense of place. Natural England has published research that suggests that an accessible natural green space should be no more than 300 metres from people’s homes in order to meet our needs for contact with nature. Evidence suggests that regular, direct contact with natural green space (and elements of the natural world such as birdsong and seasonal colour change) is good for people’s health (see below). There is also a need for increased densities in urban residential development (>30 dwellings per hectare), which could result in terrestrial green space being reduced or lost. In the urban core the provision of green space is usually already severely limited, partly through historical circumstances, and more recently because of very high land values. This makes the creation of new green space both important yet difficult. Given the nature and pressures of urban regeneration, the creation of new green spaces has to meet a number of interests. These generally result in highly formal spaces with little ecological benefit. Cities across Europe are facing this challenge. Parks on roofs are becoming common in new development plans, such as the new library in Birmingham, UK, and the large ‘Gymnasium’ roof in Paris. This particular roof has increased green space in the immediate neighbourhood significantly. Furthermore, it is roof-level green space that is accessible to the local community. Creating low-maintenance, terrestrial, naturalistic green spaces in the urban core is not popular; green roofs may provide one solution. 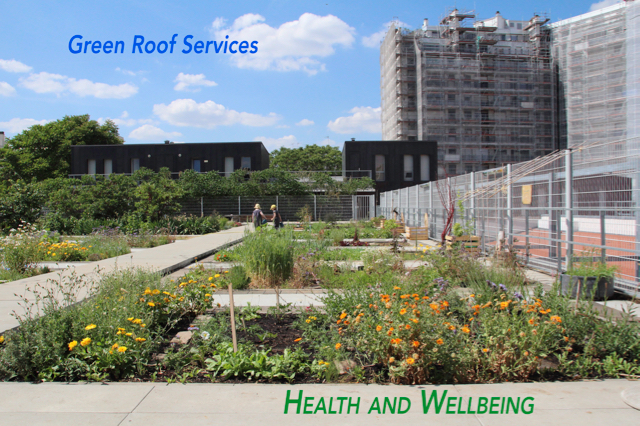 Green roofs can provide both visually and physically accessible green space. Roofs are usually visually ‘dead’ and unappealing. Their appearance to those overlooking them can be softened through the use of vegetation. There are instances where the sole justification of a green roof installation is for visual aesthetics. Areas of green roofs can also provide accessible space for people to enjoy, and some can be landscaped to extend existing green space, for example at Canary Wharf Station on the Isle of Dogs, London. Roof gardens and terraces are options for smaller buildings and have some historical ancestry. The Berlin roof gardens of the 19th Century have been adopted on similar housing blocks in Britain (for example, on the Peabody Trust’s Balderton Flats in Mayfair) and were one of the inspirations for the first modern green roof in the UK at Derry & Toms, High Street Kensington (1938), which still serves as a garden, albeit with limited public access. Large areas of accessible green roof space can be created if the building is large enough, for example above Cannon Street Station in the City of London (intensive), and at Chicago City Hall (extensive). More ‘extreme’ examples include a golf course on a roof in the USA. The key issues that need to be considered in providing accessible open urban green space are health and safety (such as the need for a external rail or fence), over-looking neighbouring properties (a material planning consideration), access to and from the roof-space, load-bearing capacity and management. These are all issues that can be easily addressed in new developments but can be limiting factors when retrofitting green roofs to older building stock.